The Michigan Theater in Ann Arbor is now run by a foundation that has managed to keep the doors open since 1979, and in the process was able to preserve a wonderful theater that harks back to the golden age of music, movies and performances. Stepping inside of this building provides you with a very real sense of what it was like to venture into a theater going back decades, and it becomes immediately clear that this is a venue that is special and can deliver a completely different feeling to those that are lucky enough to see a performance there. Built in 1928, the theater was built with the aim being that it would remain as a monument to film and music for decades to come. That is certainly something that they have been able to achieve, and there is no doubt that the architect, Maurice Finkel, designed a silent movie theater that would have been the pride and joy of any American city. Upon its construction, it consisted of a stage, an orchestra pit, an elaborate organ, ornate hallways, and seats for 1,700 people. Many of the original features remain today which just adds to the absolute joy that one feels when the walk through the doors. Approximately 300,000 people attend the Michigan Theater on a yearly basis with them taking in an array of movies and other performances across the arts. With jazz, swing and many other forms of music being covered, this theater is able to incorporate all tastes throughout the year, which in itself is a major draw card as you will almost always be able to find a performance or movie on show that fits in with your own individual tastes. 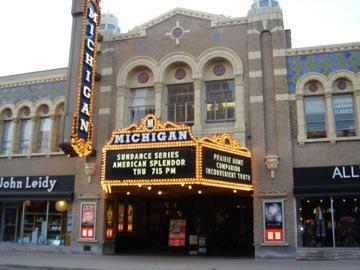 A journey to the Michigan Theater is just unlike anything else that you have experienced before. It simply beats all of the modern style theaters that are bland and devoid of character. Instead, this building draws you in and simply adds to the entire experience that you have as soon as you walk through those doors. All you need to do is to simply check out what’s on, book your tickets, and then look forward to it in a wonderful and amazing events in Ann Arbor.